Productivity is the pivotal measure to mark the success of a medical practice. What gets measured, gets managed, and what gets managed, gets improved. For targeting, modifying, or improving your efforts, you need to track data. You cannot determine the proficiency of your work, if you cannot measure the efforts. Your physical therapy software should collect all the data and present it to you in easy-to-read reports, so you can control your data in a way that improves your productivity and financial standing. Productivity of your clinic includes patient flow throughout the practice, examining workflow efficiencies, empowering employees to make informed decisions, and ensuring that your clinic has the appropriate staff strength to manage your patients. 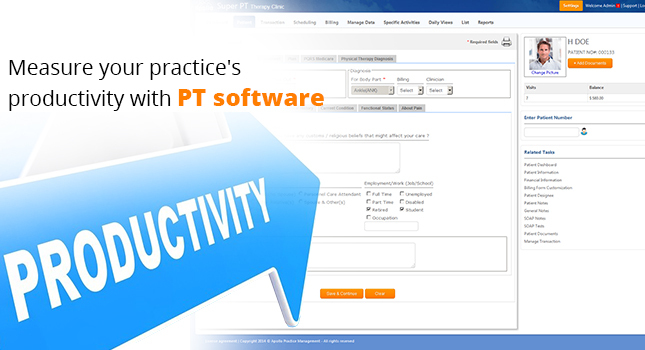 The real potential of a physical therapy software is to track information with minimal effort by the employees, and use that information to analyze the achievement of employees and as well as the practice as a whole. Today, PT billing software can provide adequate support that shapes PT practice success and patient care from a highly informed perspective. Billing metrics provide a crucial insight into the very first stage of the revenue cycle, to gain a better understanding of your revenue model before the bills are charged and visits are completed. Employee metric helps empower your staff and enables you to have the right staff number for each physician, to enhance your clinic’s productivity. It helps you measure the level of patient and employee satisfaction and make appropriate adjustments based on the data crunched. With the right Physical Therapy Software in place, you have all the needed data in hand. By identifying the metrics you want to monitor, studying all the reporting tools, and taking advantage of present data, you can make better decisions, improve productivity, and achieve success.